TBD - We're looking at dates for 2019. If you can't run but want to help us help others, please consider donating! April 29, 2002 ~ March 2, 2013. In July of 2005 Mitchell was diagnosed with Duchenne Muscular Dystrophy, a catastrophic muscle wasting disease which results in progressive muscle deterioration and is generally fatal by late teens/early twenties. By the age of 10 we discovered Mitchell's heart function had deteriorated much sooner than expected. In less than a year he passed away from acute heart failure. Originally we established a Facebook Page to chronicle our son's journey, believing he had many years ahead of him. Since his passing, we began to post photos and videos which were personal reflections on life, love and loss. The Mitchell's Journey Foundation was established to continue to share stories of hope and faith, provide families with tools to cope with loss and to help other DMD families through their struggles. Our son, whose broken heart ended up taking his life, has given our lives deeper meaning and a greater desire to serve. 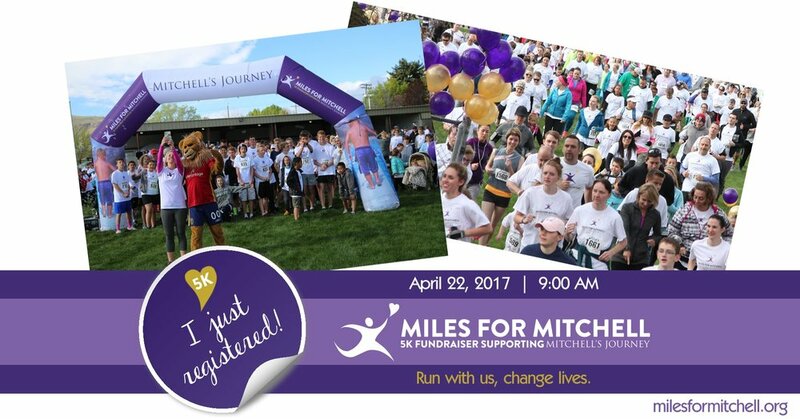 Miles for Mitchell is an annual charity run in support of Mitchell's Journey Foundation, a 501(c)(3) non-profit organization (tax ID 46-5371987).